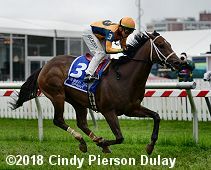 The filly counterpart to the Preakness is the $250,000 Black-Eyed Susan Stakes (G2) held on the Friday before Preakness day. 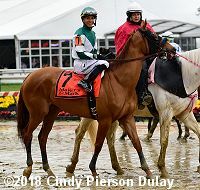 The 48,265 fans on hand at Pimlico braved intermittant rain, wind, and temperatures that started in the upper 60's and dropped to 55 by the end of the day. After over 3 days of rain, the main track was rated as sloppy and the turf course as soft. A field of 9 three-year-old fillies went to post for this 1 1/8 mile main track contest, with Sara Street sent off as the 5-2 favorite off 2nd place finishes in both the Busher and the Gazelle (G2). 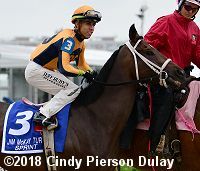 In to challenge her included 11-4 second choice Red Ruby, 4th in the Honeybee (G3), and 3-1 third choice Coach Rocks, winner of the Gulfstream Park Oaks (G2) but 7th in the Kentucky Oaks (G1). Red Ruby leads down the stretch. 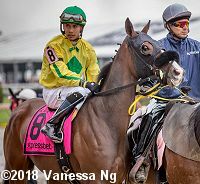 Jockey Luis Saez sent Coach Rocks to the lead first time by and she set fractions of 23.28, 47.95, and 1:12.78 while pressed by Red Ruby and stalked by Sara Street. At the top of the lane, jockey Paco Lopez sent Red Ruby to the front and she opened up a 2 length lead through 1 mile in 1:37.54. Kept to task by Lopez, Red Ruby drew off late to win by 4 3/4 lengths in 1:50.17. It was another 5 lengths back to late-running 11-1 Indy Union third, and 4 3/4 more to favorite Sara Street fourth. Left: Red Ruby heads to the winner's circle. 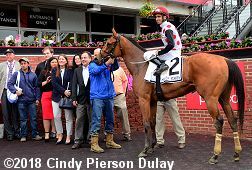 Winning trainer Kellyn Gorder said, "We knew she liked the off going. She was really good in the paddock. She was kind of pushing the pony around and was a little nervous but then she would walk a little while and settle. Paco had her really relaxed out there on the outside. When he started looking around where everyone else was, I was confident. I've had good luck with Paco and he's kind of got that style that would fit her. He takes that long hold and just raises his hands up their neck and I figured she might like that. The ultimate goal would be the Alabama. How we get there, I'm not sure." 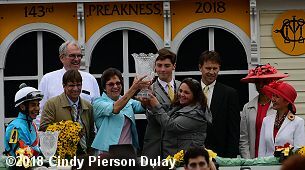 Right: The trophy presentation for the Black-Eyed Susan. Right: Red Ruby returns after the race. Winning jockey Paco Lopez said, "They told me to come from a little behind, not too close, but she broke very good. I put her second and she was very comfortable. I waited for her until the three-eighths pole, I looked and no one was coming. I said, �I got to go,' and she finished very well today. Right: Second place finisher Coach Rocks leads first time by. Trainer Dale Romans said, "I thought Coach Rocks ran super. I think we just got outrun. That's a really good filly that won it. 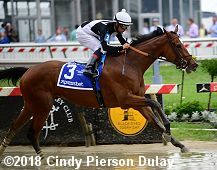 [Robby] Albarado has been singing her praises since he broke her maiden. No telling how good she really is. She's just going to get better and better, and we'll head to the Alabama next, probably. That's a good filly that beat us, but we'll fight another day." Left: Third place finisher Indy Union in the post parade. The Jeremiah Englehart trainee improved her record to 1 win, 1 second, and 2 thirds in 7 starts, earning $110,117 for owner Robert Hahn. Right: Fourth place finisher and beaten favorite Sara Street heads out to the track before the race. The Kiaran McLaughlin trainee has a record of 1 win, 2 seconds, and 0 thirds in 5 starts, earning $153,100 for owner-breeder Godolphin LLC. 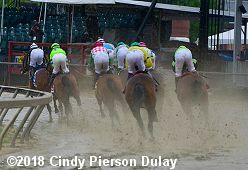 Right: Splashing around the clubhouse turn in the Black-Eyed Susan. 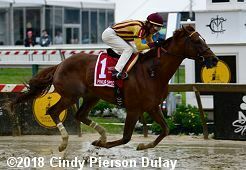 The co-feature on Friday is the $300,000 Pimlico Special (G3). A field of 8 older horses contested this historic 1 3/16 mile trip, with Charles Town Classic (G2) winner Something Awesome sent off as the 9-4 favorite over 7-2 One Liner, an allowance winner last out, and 4-1 Irish War Cry, 6th in the Gulfstream Hardacre Mile (G3). 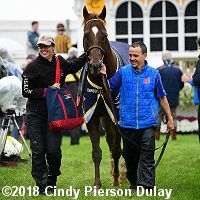 Jockey Jose Ortiz sent Irish War Cry to the lead first time by and he set fractions of 23.19, 47.25, and 1:11.58 while pressed by One Liner and stlked by 7-1 Afleet Willy. Entering the lane, Irish War Cry opened up a 2 1/2 length lead through 1 mile in 1:36.36. Kept to task by Ortiz, Irish War Cry drew off to win by 4 1/2 lengths in 1:55.51. One Liner and 8-1 Untrapped dead-heated for second. 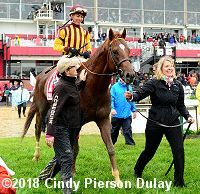 Left: Owner Isabelle de Tomaso leads Irish War Cry to the infield winner's circle. 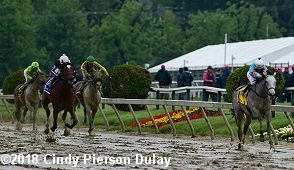 Winning trainer Graham Motion said, "I just wanted to get him back on track and I feel like today we did that. It was important to me. This horse shows so much in the morning and it's so frustrating to see him run disappointedly in the afternoons. He really did get the thumps last time. I really think the hot, humid weather at Gulfstream doesn't agree with him. He's run his two poorest races down there. I think getting the cooler air of today is like running at Aqueduct last year. It's just a different deal. It was very reassuring." Right: Irish War Cry heads back to the barn. Winning jockey Jose Ortiz said, "The key was the distance today. With the 1 3/16 miles, he broke well, I let him run to the first turn, took a hold of him and he got under his feet beautifully. When I asked him by the three-eighths pole, he kept going and gave me everything he had. I am glad he showed up today because he has been working really nice in the morning. I worked him all winter. He wasn't performing at Gulfstream in the winter. Today he finally ran well." 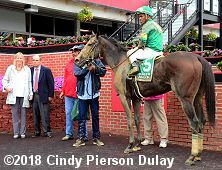 Closing out Friday's stakes septet was the $150,000 Allaire DuPont Distaff Stakes (G3) featuring a field of 8 older fillies and mares going 1 1/8 miles on the main track. Top Flight Invitational winner Blue Prize was sent off as the 11-10 favorite over 2-1 Verve's Tale, 3rd in the Royal Delta (G3), and 7-2 Fuhriously Kissed, 3rd in the Apple Blossom (G1). Blue Prize and Verve's Tale dueled for the lead through fractions of 23.56, 47.52, and 1:12.12 while stalked by 74-1 longest shot Katalust. Entering the stretch, Blue Prize opened up a 2 length lead through 1 mile in 1:38.13, but 9-1 Song of Spring, last early under Ricardo Santana Jr., came out 5 wide and rallied to win by 1/2 a length in 1:51.10. It was 2 1/4 lengths back to late-running Fuhriously Kissed third. Left: Song of Spring in the winner's circle. 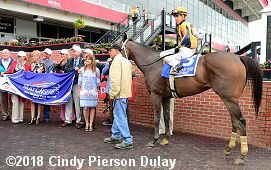 The Neil Howard trainee has a record of 4 wins, 2 seconds, and 3 thirds in 15 starts, earning $228,643 for owner Stoneway Farm. Right: Second place finisher and beaten favorite Blue Prize in the post parade. The Ignacio Correas IV trainee has a record of 4 wins, 7 seconds, and 1 third in 13 starts, earning $486,193 for owner Merriebelle Stable. 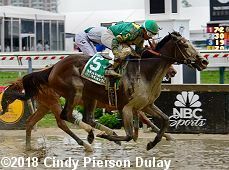 A field of 9 three-year-old fillies sprinted 6 furlongs in the $150,000 Miss Preakness Stakes (G3). 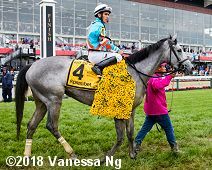 Good Move, undefeated in 2 starts, was the 8-5 favorite over 7-2 Almond Roca, winner of the Gasparilla but 6th in the Florida Oaks (G3), and 4-1 Happy Like a Fool, 4th in the Beaumont (G3). Jockey Tyler Gaffalione sent Happy Like a Fool to the lead exiting the chute and she set fractions of 23.06 and 46.13 while pressed by 6-1 Artistic Diva and stalked by 26-1 Bootsy's Hadenough. Entering the lane Happy Like a Fool opened up a 2 1/2 length lead through 5f in 57.90. Kept to task by Gaffalione, Happy Like a Fool drew off to win by 6 1/2 lengths over Artistic Diva in 1:10.12. It was another 3/4 length back to 35-1 longest shot Buy Sell Hold third, while favorite Good Mood checked in 6th. 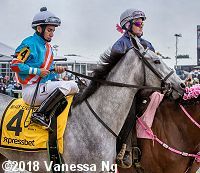 Winning jockey Tyler Gaffalione said, "She broke really well. I just chased her out of there to get position. When I asked her at the top of the lane, she really responded. (Trainer) Wesley (Ward) did a good job of having her ready. It's pretty sloppy; it's not the worst thing and she could handle it. You have to pay attention to the [track] bias. It seems like it is changing every race. One race is speed, then another race they are coming off the pace. It's pretty fair � you just have to pay attention." 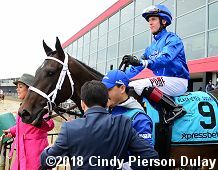 The $100,000 Jim McKay Turf Sprint featured a short field of just 5 older horses going 5 furlongs on the turf. Imprimis was the 4-5 favorite over 5-2 Rocket Heat and 6-1 Field of Courage. Rocket Heat was quickest away through fractions of 23.56 and 50.02 while as many 3 lengths clear of Imprimis stalking in second. Entering the lane jockey Irad Ortiz Jr. sent Imprimis to the front, and he took over inside the 3/16 pole, drawing off late to win by 5 1/4 lengths over Rocket Heat in 1:03.81. It was another 1 1/2 lengths back to 7-1 Oak Bluffs third. 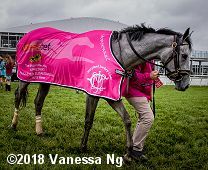 Left: Imprimis in the winner's circle. 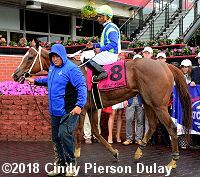 Winning trainer Joe Orseno said, "It was a big step bringing him here after two allowance races but his numbers were good enough and he trained like he was that kind of horse, so we decided to take a shot and bring him here. It was nice to know we had a lot of horse left [turning for home], when he kicked in and responded really well. He went up to [Rocket Heat] and kind of went right by him. He does what he has to do early and then he just kicks into the next gear." Right: Imprimis in the post parade. 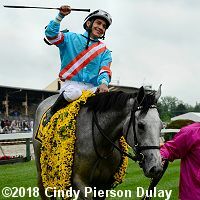 Winning jockey Irad Ortiz Jr. said, "He's a nice horse. He makes you feel like you have a lot of horse underneath you, so I rode him with confidence. I rode him for the first time last time [optional claiming win at Gulfstream Park on March 24]; he's improving and he's doing pretty good. The going was no problem for him. It's tough to make up some ground today but he handled it fine." 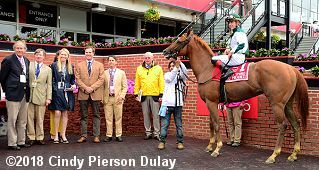 Immediately after the Black-Eyed Susan, the $100,000 Hilltop Stakes featured a field of 6 three-year-old fillies going 1 mile on the turf. 7-5 favorite Souper Striking set a slow pace of 26.18, 53.40, and 1:22.60 while pressed by 8-1 Judge Lee and stalked by 22-1 Wendy Peffercom. Entering the stretch, Souper Striking, confidently ridden by Julian Pimentel, left the field in her wake, drawing off to win by 6 1/4 lengths over 2-1 second choice Secret Message in 1:51.72. It was anoter 4 lengths back to 5-2 third choice Peach of a Gal third. Winning trainer Mike Trombetta said, "You don't know how these horses are going to handle this kind of going. There is no way to practice for it. You just hope that good things happen and for her it did. She was able to keep on getting it. She did well." 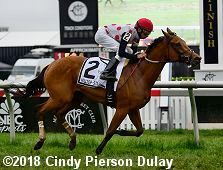 Jockey Julian Pimentel added, "She was going pretty comfortable. She seems to enjoy that surface, so it worked out well for us. Nobody came to pressure us or anything." 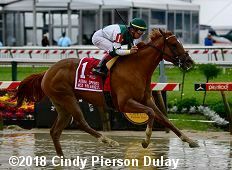 Kicking off the Preakness weekend stakes, the $100,000 Skipat Stakes featured a field of 5 older fillies and mares sprinting 6 furlongs. 6-5 favorite Ms Locust Point set the pace of 23.03 and 46.31 while pressed by 13-10 second choice Vertical Oak and stalked by 5-2 third choice Startwithsilver. Entering the lane jockey Ricardo Santana Jr. sent Vertical Oak 4 wide to lead. Kept to task by Santana, Vertical Oak held off Startwithsilver to win by 1 1/2 lengths in 1:10.35. It was another 1/2 length back to Ms Locust Point third. 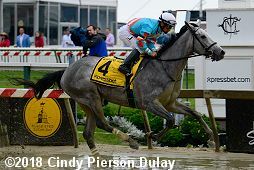 Winning trainer Steve Asmussen said, "She's a nice filly. She's run super races on an off racetrack . The draw was great for her and so was the result. 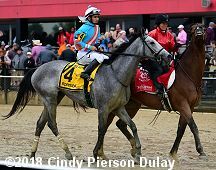 She won the Miss Preakness here last year and this was the target. We hope she has a very good year. And now she'll likely head to New York." Jockey Ricardo Santana Jr. added, "I had a pretty good trip,"said Santana. "She did everything right and responded when I asked her. I had won on her before [maiden victory at Saratoga and optional claiming win at Churchill Downs] but this is my first stakes win with her."